The high of racing on British Columbia’s biggest stage seems to last well after passing under the final finishing banner. Rest and recuperation become crucial in the days following the province’s premier cycling event—for some, a day or two off the bike or (at the very most) a coffee ride is a highly anticipated part of the rest week. Riders must stay sharp, however, as the first annual Awesome Grand Prix - BC Criterium Provincials fast approaches. As good reading material is often appreciated during a cyclist’s easy spin to their local coffee shop, here is TRT’s BC Superweek recap from Thursday on. In the heart of Burnaby, British Columbia, the Giro di Burnaby brings a unique flair to the BC Superweek series. 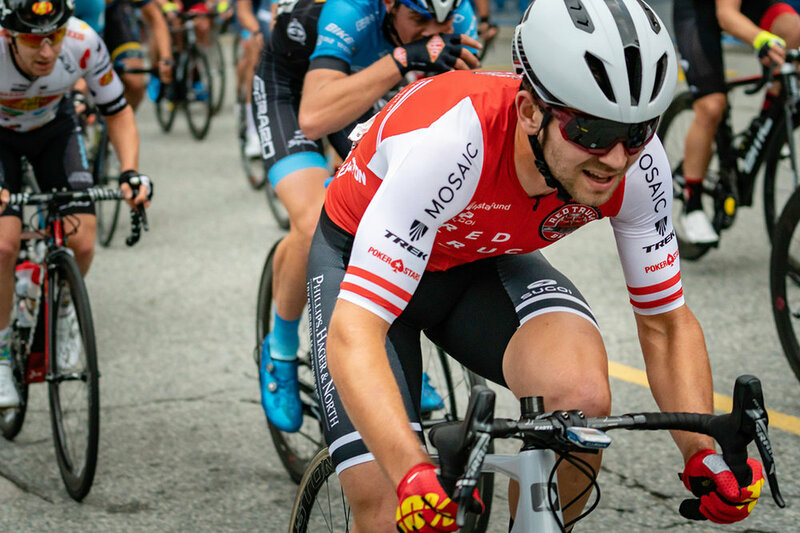 Taking place on a special section of Hastings St., the circuit is lined with bakeries, wine bars, and tricolour flags—the cultural heritage behind the Giro di Burnaby is as unmistakable as the extravagant Italian supercars that control the race. Riders were eager to redeem themselves after a very select race in Gastown. Trek Red Truck women pushed their way towards the front at the start line. TRT up-and-comer, Callie Swan, received yet another start line call-up. She gathered at the front with professional favourites and a few local names. The Giro began with TRT highly represented towards the front. Veteran rider and track sensation, Erin Attwell, got out front early to collect her first prime of BC Superweek. Riders Isabella Bertold, Holly Simonson and Michelle Schaeffer each tried their luck going off the front. Their efforts earned lots of praise from onlookers and team recognition from the announcer. Maintaining good position throughout the race, TRT entered the nail-biting finale in an ideal spot on the road. Overrun, however, by other bigger squads in the final few hundred metres, the women’s squad still held on for respectable finishing places in the bunch. Callie Swan achieved an impressive tenth-place, while Holly Simonson and guest rider, Sarah Van Dam, finished fourteenth and sixteenth place, respectively. Summer Moak of Rally Cycling got the win in a sprint finish over TaG’s Maggie Coles-Lyster and Kendall Ryan of TIBCO-Silicon Valley Bank. On the men’s side, Jay Lamoureux and Brendan Armstrong rode strong races, riding consistently towards the front. After an early mechanical, Eric Young of Rally Cycling stormed up the road and stole the crowd prime. Young managed to stay away after securing the prime, taking the overall win as well. Florenz Knauer sprinted to second place with Holowesko | Citadel Cycling Team’s, Joseph Lewis, coming in just behind. My race was the first of the day. The 3:15 PM start was far from next Red Truck event of the evening: the pro 1/2 women at 7:50 PM. Steve and Brian were kind enough to come out with the team van hours ahead of schedule to offer me support… I felt pretty spoiled. The race started just as the temperature peaked for the day. My Garmin read thirty-four and a half degrees Celsius. With just over thirty minutes of race time, it wasn’t long before attacks started going off the front. I got in a couple of the moves but realized I didn't want to be using my energy so early on. A crash ahead of me on the final lap put an end to my hopes of contesting the sprint. Anna Talman made a bold effort at the front, surprising the field and causing them to chase. Holly Simonson got herself out front before the crowd prime—gaining significant television time and high praise from the announcers. Simonson went on to finish ninth in U23 and twenty-third overall. Guest rider, Sarah Van Dam, had a remarkable result, finishing the evening with a fourth place in U23 and tenth overall. Van Dam thrived on the sprinter-friendly course and looked comfortable riding in the elite field. With seven laps to go, there was still four primes left to be dealt. Riders had to choose whether or not to sacrifice their energy before the finishing sprint. To coax the riders into action, the race announced larger and larger payouts. In the finale, Kendall Ryan bested Sara Bergen and Maggie Coles-Lyster in a dramatic dash to the line. Although this year’s edition of the PoCo Grand Prix celebrated itself as BC Superweek’s first “twilight criterium,” riders and fans were hard-pressed to see any glow left in the sky. With LED lights placed throughout the course, the massive field of pro men launched into pitch black corners and chicanes. Racing was reminiscent of a Portland fixie crit. Eventually officials placed more lights on course—a welcomed gesture for the riders. TRT favourite, Kyle Buckowsky, experienced rib pain after riding a spare bike for most of Gastown. He pulled himself early in the race to recover for the Tour de White Rock. Al Murison made a historic comeback after last Sunday’s injury. The TRT big-hitter made a successful dash to the line to receive a thousand-dollar prime. In the end, the pro-teams were robbed by Manitoba-native, Mitch Ketler. The Applewood Garneau p/b Smart Savvy U23 rider made his move in the final corner, catching the favourites off-gurad. Florenz Knauer, a sprinter from German team Herrmann Radteam, tried to make it around Ketler but only managed to hold on for second spot. Third place went to William Myers of Marc Pro Cycling p/b Gym One. The Tour de White Rock’s Choices Markets Criterium is a traditional test of mettle for BC Superweek goers. After a long week of racing, countless athletes dread the criterium’s notorious climb. I found myself off the front several times in the beginning. Sometimes it was responding to attacks, other times it was just to test the legs. Unfortunately—however much I was enjoying myself—the pack was taking advantage of my chase efforts. The stronger riders would counter me as soon as I'd come back to the group. Wasting energy early on meant I didn't have much left to chase down riders later on. ‘Out of sight, out of mind’ was the quote of the day. A rider lapped the field and another escaped off the front. I finished in the bunch. Not a great race, but it felt good to put the hilly White Rock Crit behind me. It wasn’t long before riders started to get pulled in the pro women’s race. Strong efforts from Rally Cycling and TIBCO – Silicon Valley Bank shattered the field in no time at all. It was just Callie Swan and Michele Schaeffer who managed to stay in until the end—both admitting it was one of the most intense efforts of Superweek thus far. Alison Jackson took the win after attacking over the final climb and out-sprinting her rivals. Ariane Bonhomme of Cyclery Racing took second spot ahead of TaG’s Maggie Coles-Lyster. On the men’s side, Al Murison and Chris McLeod had excellent races. McLeod got into early moves and could be seen towards the front for much of the race, while Murison sprinted to an impressive tenth place overall. It was Christopher Hatz of Herrmann Radteam who started the decisive move up the road for the pro men. After the German's impressive solo display at Gastown, he was quickly marked by Silber Pro Cycling’s, Ryan Roth, and Eric Young of Rally Cycling. The three escapees worked together and lapped the field by their twenty-seventh time around. When the bunch was forced to sprint for minor placings, a crash in the field caught out Hatz and Young. Roth, although positioned directly behind the accident, managed to skirt around the carnage and ride himself to the win. The final day of the 2018 BC Superweek was well received among members of TRT. After yesterday’s challenging crit, many hoped to simply contribute whatever they had left in their legs. Determination and morale were raised with the idea of just one race remaining. TRT's roster for the White Rock Road Race consisted of Bertold, Schaeffer, Simonson, Swan, Guloien, Van Dam and Talman. The race marked the on-bike return of the women's squad manager, Leah Guloien, and yet another appearance by men’s squad mentor, Clarke Lind. Holly Simonson dawned her U23 Provincial Road Race Champion jersey in an elite race for the first time since winning it in May. Not long into the race, the pack settled to let a solo Desjardins-Ford p/b Cromwell rider up the road. At its peak, the gap got up to around two minutes. After the race regrouped, Michele Schaeffer and Callie Swan represented TRT in a newly formed group up the road. The two stayed in the leading group until the end. Schaeffer contested the sprint and finished eleventh, respectively. After a long and impressive day, Callie Swan finished just behind the bunch in sixteenth spot. Team TIBCO-Silicon Valley Bank’s favourite for the race, Alison Jackson, sprinted to the win ahead of TRT alumni and Rally Cycling member, Gillian Ellsay. Rise Racing’s, Megan Rathwell, rounded out third spot. In the men's race, Diertens, Lind, Armstrong, Murison, Buckowsky, MacLeod, Lamoureux and Van Den Ham took their spots at the start line. “I get into a break here every year… I love this race” said TRT alumni and guest rider, Michael Van Den Ham. The cyclocross specialist was true to his word, getting into the first strong move of the day. Van Den Ham’s break was brought back and countered. Men’s team mentor, Clarke Lind, managed to get himself into the newly established move of around ten riders. Upon realizing the calibre of the break, Kyle ‘Buck Wild’ Buckowsky, bridged his way up to the escapees. Lind and Buckowsky worked to further themselves from the main peloton. A smaller group which included Delta Road Race winner, Adam de Vos, made its way off the front of Buckowsky and Lind’s pack. With few laps remaining, Brendan Rhim of Holowesko | Citadel Cycling Team decided to go it alone. By the time the men's field reached final circuit laps, only nineteen of the over one-hundred and ten starters remained. In a remarkable feat, Rhim of Holowesko managed to stay away and claim the overall win. Over a minute later, Christopher Hatz of Herrmann Radteam crossed the line ahead of his teammate, Florenz Knauer.